The town of Waimea is located in the South Kohala District of Hawaii's Big Island. Waimea is the largest town in the interior of the Big Island. It is located about 20 miles northeast of the Waikoloa Resort area, 13 miles west of Honokaʻa, 22 miles west of Waipiʻo Valley and 18 miles south of Kapaʻau. 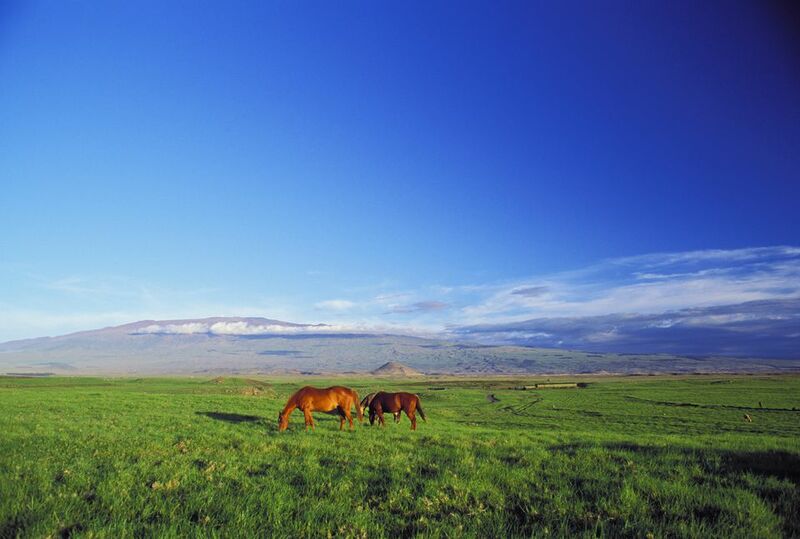 Waimea lies in the rolling green foothills above the Kohala Coast. The town and surrounding areas are growing rapidly. The original name of the town and nearby land stretching to the sea was Waimea. In Hawaiian, Waimea means "reddish water" and refers to the color of the streams that flow from the hapu' forests in the Kohala Mountains. A problem arose with mail delivery since there are other places called Waimea in the Hawaiian Islands. The postal service demanded a new designation for the town. The name Kamuela was chosen in honor of Samuel Parker, the son of the area's most famous historical resident. "Kamuela" is the Hawaiian word for Samuel. Waimea sits at 2,760 feet above sea level. The temperature is warm throughout the year. Temperatures average around 70°F in the winter and 76°F in the summer. Lows range from 64°F - 66°F and highs from 78°F - 86°F. Annual average precipitation is just 12.1 inches - not quite as dry as the western "leeward" side of the island, but not as wet as the eastern "windward" side. Showers occur year round in this area, but most often at night or in the late afternoon. Waimea has a diverse ethnic population of 9212 as of the 2010 United States government census. 31% of Waimea's population is White and 16% Native Hawaiian. A significant 17% of Waimea's residents are of Asian descent - primarily Japanese. Nearly 34% of its population classify themselves as being of two or more races. 9% of Waimea's residents, primarily descendants of the original paniolos (cowboys), identify themselves as Hispanic or Latino. The history of Waimea and the Parker Ranch is one of the most interesting stories in Hawaiian history and much too interesting to condense here. You can read our feature A Brief History of Waimea on Hawaii's Big Island for more information. The closest airport to Waimea is the small Waimea-Kohala Airport located about 2 miles southwest of town. Kona International Airport at Keahole is located approximately 32 miles southwest of Waimea in Kailua-Kona. Hilo International Airport is located roughly 43 miles southeast of Waimea in Hilo, Hawaii. Waimea is about 30 - 45 minutes from the major resorts on the Kohala Coast of the Big Island. These include the Fairmont Orchid, Four Seasons Resort Hualālai, Hapuna Beach Prince Hotel, Hualālai Resort Mauna Kea Resort, Mauna Lani Resort, and the Hilton Waikoloa Village. There are three hotels located within Waimea proper: The Jacaranda Inn, the Kamuela Inn, and the Waimea Country Lodge. There are also a large number of bed and breakfasts in Waimea. The Kohala area of the Big Island of Hawaii is home to some of the best restaurants on the island. In Waimea, you will find Merriman's, famous for its Hawaii Regional Cuisine. You'll also find Under the Bodhi Tree, offering a vegetarian cuisine and the Hawaiian Style Cafe, a cozy diner featuring a mix of Hawaiian dishes & American home cooking for breakfast and lunch. This festival showcases the annual blooming of Waimea's cherry trees along Church Row Park, and the Japanese tradition of "hanami," or cherry blossom viewing. Parker Ranch, Hawaii's largest working ranch near the town of Waimea (Kamuela), hosts paniolos in roping and riding competition. Horse races, food and entertainment add to the fun. The Paniolo Parade features princesses on horseback with attendees decorated with the flowers of their respective islands. The Parade is followed by one of the best crafts show of the year featuring island foods, games, arts & crafts, Hawaiian products and live entertainment in Waimea Ballpark. The event takes place at the Kahilu Theatre in Waimea. Workshop and performance schedule are posted on the Kahilu Theatre's website.